The NEH grant-funded project “Writers Without Borders: Creating Global Access to the PEN International and English PEN Records” includes cataloging and creating an online finding aid for the records. Spanning from 1912 to 2008, the collection contains administrative records and details international meetings, work of committees and undertakings of the organization. Also included are more than 100,000 pieces of correspondence revealing exchanges between members and documenting the association’s major issues and priorities. Some of the represented writers include Chinua Achebe, Elizabeth Bowen, T. S. Eliot, Robert Frost, Nadine Gordimer, Günter Grass, James Joyce, Arthur Miller, Octavio Paz, Salman Rushdie, Aung San Suu Kyi, Virginia Woolf and W. B. Yeats. To expand access to the records, 4,400 images will be digitized and made freely available online. Digitized images will include PEN newsletters, minutes, reports, scrapbooks and ephemera in the archive. A portion of the digitized images will be selected for the creation of an online teaching collection webpage, providing teachers and students the opportunity to engage with archival materials. Topics and teaching modules will explore global refugees and writers in exile, free speech, writing about World War II, the global Cold War and international human rights. Founded in 1921 to foster friendship and intellectual cooperation among poets, essayists and novelists, the association quickly shifted focus as its membership challenged the rise of fascism across Europe. Today, the association self-identifies as the “world’s first human rights organization,” defending freedom of expression and promoting literature through programs implemented by its global network of 149 centers in more than 100 countries. PEN. 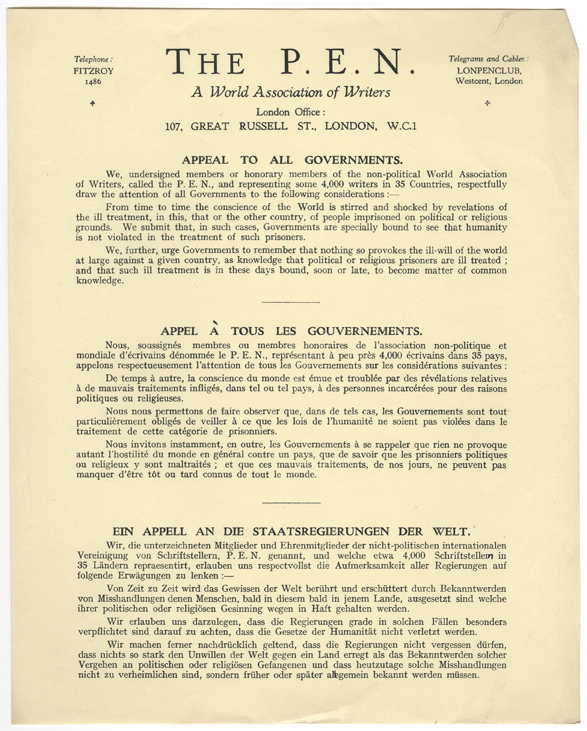 Appeal to All Governments, printed text in English, French, and German, 1931. Nearly a century after its founding by British writer, poet and playwright Catharine Amy Dawson Scott, PEN has left an indelible mark on international politics, culture and literature, with a membership that now extends to journalists, publishers and editors. The Ransom Center will complete the project by September 2019. The research value of the PEN records is enhanced by related collections at the Ransom Center, which document authors who were officers or active members, among them John Galsworthy (PEN’s first president), Sybille Bedford, Christine Brooke-Rose, Nancy Cunard, D. H. Lawrence, Norman Mailer, Arthur Miller, J. B. Priestly, W. Somerset Maugham, George Bernard Shaw, Tom Stoppard and H. G. Wells. What’s in the PEN archives? Thats great news that you are getting this grant to promote writings.Is their any chance to get membership as a journalist and writer form Pakistan? I would like to avail this opportunity.